Looking For Answers Beyond The Cosmic Horizon : 13.7: Cosmos And Culture The notion that the Big Bang is like an exploding bomb is completely wrong. But what, then, lies beyond the edge of space? Can we ever know whether the Universe is infinite? This spectacular image of the large spiral galaxy NGC 1232 was obtained by the European Southern Observatory's Very Large Telescope (VLT) in 1998. NGC 1232 sits in the constellation Eridanus (The River) at a distance of about 100 million light-years and is about twice the size of the Milky Way galaxy. Where does the Universe end? Or, to put it differently, does the Universe have an edge? When cosmologists say that the Universe is expanding, people tend to think of an exploding bomb. They see galaxies as shrapnel, flying off in all directions. Even if intuitive, this image is dead wrong. The cosmic expansion is an expansion of space itself. Since Einstein's theory of general relativity, space has been endowed with a plasticity that allows it to expand, shrink or fold like a rubber balloon in response to the presence of matter (and energy). Imagine that you, from your galaxy, observe other galaxies around you. Due to the expansion, most of them are moving away from you. 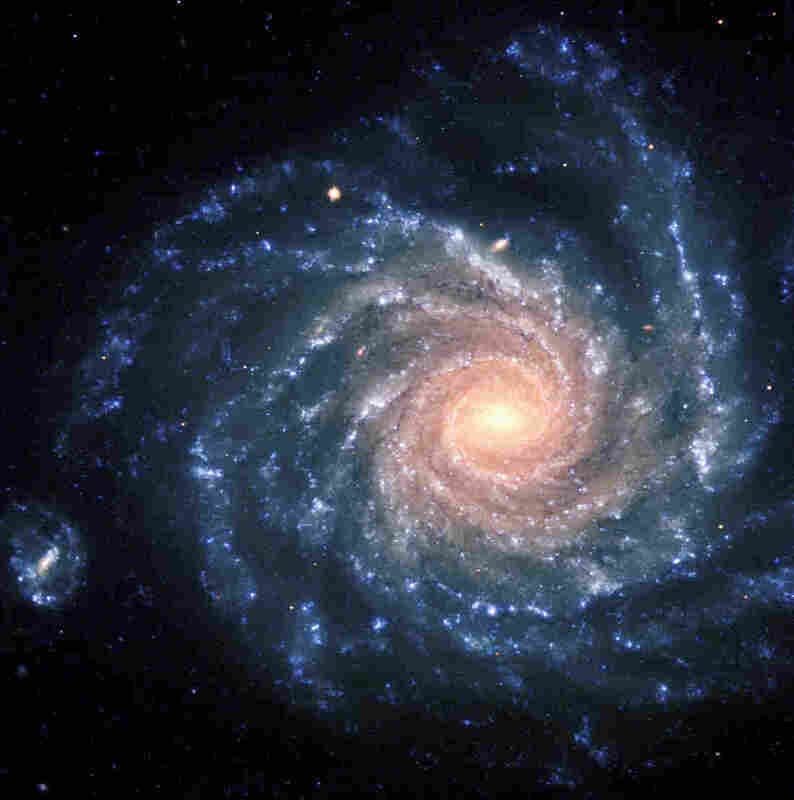 You'd then conclude that you must be the center, since every other galaxy is receding from you. However, an observer in another galaxy will see the same thing: every one else receding from her. The same with each and every galaxy. In the Universe, space is the ultimate democracy: all points are equally important. But if this is true, how to explain the smallness of space near the Big Bang? If the Universe is expanding, in the past distances were shorter. Astronomers can measure the recession speed of galaxies and, from them, project when they would have been "on top" of one another in a tiny volume. This moment marks the beginning of our cosmic history. According to modern measurements, this happened some 13.7 billion years ago, about three times longer than the age of the Earth. Even here, as long as we can talk about space, all points on it are equivalent. Only when we reach the "singularity" do things break down: however, the notion that space shrinks to nothing at time zero is an extrapolation based on classical ideas and is surely wrong: new physics kicks in when the Universe is very small. When we consider the finite cosmic history and the speed of light together, we arrive at a key concept, that of the cosmic horizon: since the speed of light delimits the speed with which we can receive information, in a Universe with a finite age we can only receive information from objects situated at the maximum distance that light could have covered within this time. Somewhat like the horizon at the beach, that delimits how far we can see. But the ocean doesn't end at the horizon: there is more water beyond. What about the Universe? It also keeps on going. Probably. We can't be completely sure since we can't get information from beyond the horizon. And how far is that? If the Universe weren't expanding, the distance to the horizon would be 13.7 billion light-years. But since space gets stretched with the expansion, light waves get lift and we can see further than that: the cosmic horizon is roughly at 42 billion light-years away. Beyond the horizon, the Universe could keep on going, if space is indeed infinite in all directions. It could also be closed on itself, like the surface of a balloon (but in three dimensions, not something easy to visualize), or be really weird beyond what we can see. The existence of a cosmic horizon implies a fundamental limitation to how much we can know: we are partially, if not totally, blind to what lies beyond. There could even be a multiverse out there. To eventually find the answers to these questions will surely take a lot of ingenuity and, possibly, a new set of physical laws.